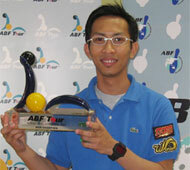 15th April, Kuwait: Doha Asian Games gold medalist, Ryan Lalisang of Indonesia, scored a rare double after defeating challenger, Jason Belmonte of Australia, 201-191 in the ABF Tour Kuwait Leg 2007 to add to the 4th Kuwait International Open title he took on Saturday. The champion had earlier edged UAE's Mahmood Al Attar 222-212 in the first semifinals while Belmonte knocked out local hopeful, Fadhel Al Mousawi of Kuwait, 219-212 in the other semifinals to reach the finals. Ryan Lalisang, who bagged the 4th Kuwait International Open title and US$25,000 on Saturday, started with a double to take a one frame lead over his challenger, Jason Belmonte. Despite narrowing the gap with a double in the third and fourth frames, the Aussie made two costly mistakes by opening frames 5 and 8. While the Indonesian also had an open frame in the sixth, a double strike in the 10th and 11th frame proved sufficient to seal the victory. Belmonte did have a chance if he could strike out, but an eight pin in the 11th frame prove decisive. The champion and top-seed was on a row knocking out Somjed Kusonpithak of Thailand, 241-183 in Round 1 and another Kuwaiti, Basel Al-Anizy, 221-183 in Round 2 to confirm his spot in the semifianls. The runner-up posted the highest game of the leg when he downed 299 against Thailand's Yannaphon Larpapharat's 221 in the first round. Belmonte also edged Yousif Akbar of Saudi Arabia 38-34 after having tied at 224. Highlights of the ABF Tour - Kuwait will be televised later on local television stations of the eight countries where the tour is being held. It is also broadcast later from parts of Europe, Africa, the Middle East, central Asia, China and Australasia with an estimated audience of around 90 million. For further information and details please contact ABF Tour Committee Marketing and Event Management Division at Tel: +852 2810 5191; Fax: +852 2810 5192; Mr. Ritchie Lai (Mobile: +852 93598669; email: ritchie.lai@tndgroup.com) or or Mr. Steven Chan (Mobile: +852 9303 3102; email: steve.chan@tndgroup.com).